Snowpiercer has a cast filled to the brim with brilliant, entertaining actors and a director whose back catalogue is, for my money, closer to perfect than any other working director’s. Despite this, I didn’t go into it with high expectations, mostly due to some pretty dull trailers. And my fears were confirmed. 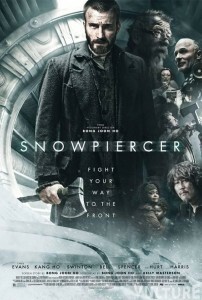 Whereas Bong Joon-ho’s previous films are delightfully entertaining with complex themes so subtle that engaging with them is basically optional, Snowpiercer is as direct and hard to move around in as the train it takes place in. I can see how the stripped-down nature of the concept could seem like an exciting one for an action film; A train full of Earth’s last survivors where poor people live in squalor in the back and rich people live in decadence in the front, and the journey from one end to the other. It’s a concept that travels along with its plot, and has momentum built into it; It’s probably the most inherently action oriented concept for a movie since Speed. And the themes of class are sound, they’re astute and well constructed. But after seemingly endless monologues from multiple characters who exist only as mouthpieces for said themes, you start feeling sorry for the dead horse Boon-ho is beating long before the end of the movie. This is a movie where they dress Tilda Swinton, hamming it up like never before, like a cartoon character and then make her endlessly deliver dialogue like “We must occupy our pre-ordained position.” and “Know your place.” Stating this outright once would have been hand-holding, but practically all the dialogue in the film is merely restating it. Then you have to sit through Ed Harris explaining it all again like three or four more times. Who can say why Joon-ho decided to abandon subtlety for Snowpiercer. It sure wasn’t for a wider appeal, not in his home country anyway. He’s basically the James Cameron of South Korea, helming many of the top-grossing films in their history. Was it a concession to the English speaking audience, this being his first movie primarily aimed at them? (If so, that blew up in his face- the US distributor was apparently worried that this movie wouldn’t play well domestically and crippled its distribution when Joon-ho wouldn’t let them re-edit it.) Did he just simply want to try something new? At the moment we don’t know, but it feels like the release of the Coen Brothers’ Intolerable Cruelty; A whiff so hard from someone previously so consistently excellent you can’t help but struggle for an explanation. Adding insult to injury are the action scenes. The one or two that work, work because they’re excellent ideas, not because they’re presented especially thrillingly. The rest of the action scenes, the bulk of them, present us with no specific action, just signifiers of action; frames filled with people swinging objects at other people with no apparent effect or consequence. Noise. The action in The Host, the most action-oriented of Joon-ho’s previous films, worked as anti-action; It was a monster movie in broad daylight, everything happened slowly, there were very few surprises. It radiated subversive glee. In a movie as direct as Snowpiercer, if the action doesn’t carry the weight, the whole affair doesn’t land with a thud, it lands in a puff of air.